OPINION: Full credit to Danny Wilson for good start, but have Chesterfield FC got strength in depth? After what can only be described as a turbulent close season, full credit has to go to Danny Wilson, his backroom staff and players for a brilliant start to the campaign. It would have been all too easy for the playing staff to lose their concentration after all that has occurred. However Saturday’s victory against Swindon, followed by a 2-0 success at the Proact against Walsall, has created a feel good atmosphere around the club once more. I don’t believe it would be much of an exaggeration to suggest that we could be on for season not too dissimilar to 2014-15. However as good as our start has been as a supporter I still have some concerns about the depth of our squad. Looking beyond the starting XI and bench we do not seem to have sufficient cover for the entire campaign. Of course once Lee, Jones and Martinez are back from injury we will have a few more numbers to rely on, but I still believe that if, throughout the season, we pick up several knocks and injuries the quality in our line-up will soon diminish. I hope now that the time has come to move on Sylvan Ebanks-Blake, that isn’t to say that I believe him to be a poor quality player, but he isn’t the right type of footballer for our style of play. SEB needs someone to play alongside him, someone who can do the running and set up chances for him to convert. 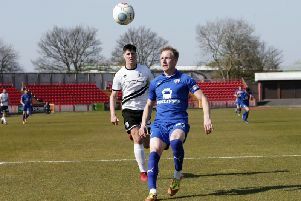 He is very similar to Marc Richards, who also never seemed to live up to his full potential at Chesterfield because at times we wanted him to play up front on his own and that just isn’t his game. For these reasons I do worry that we will not get the best out of Kristian Dennis, who appears from the little I have seen of him as a player who needs to get a lot of chances created for him in order to gain a significant goal scoring tally. Although he divides opinion amongst some members of the fan base, Ched Evans certainly is the type of striker who works for our style of play. He has an incredible work ethic and as his first on Tuesday showed he can score a goal from absolutely nothing, fingers crossed he can carry on that form for the rest of the season as a massive profit could be on the horizon for the club if so.